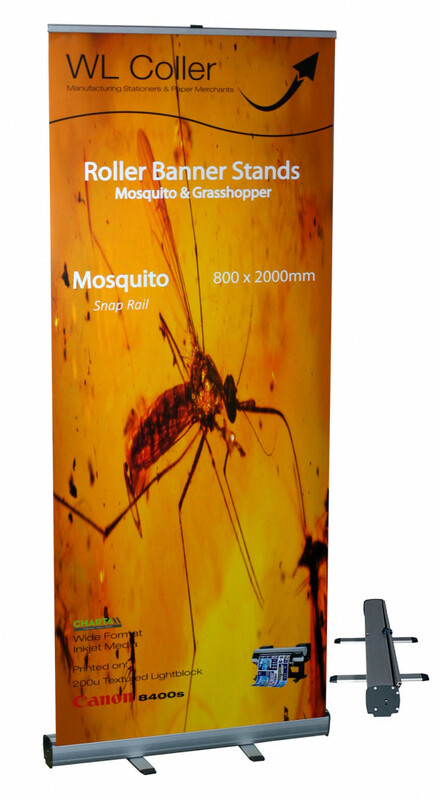 Grasshopper Roll Up Banner exhibition or display stands are simple to erect and easy to carry in the supplied case. With a 1 year guarantee* these are strong and durable portable exhibition stands. The construction of the Grasshopper is more robust, and the finish is a better quality than some of the cheaper models available. In particular the end-caps are coated and finished nicely, made of a thicker grade of alloy sheet. The Grasshopper is the same model as the Mosquito, but with a self adhesive top rail for attaching the banner material, compared to the Mosquito’s snap-closed top rail which pinches the banner material to hold it securely. Both Grasshopper and Mosquito models, like all our banner-stands, use self adhesive tape to secure the bottom of the banner material to the base. Banner stand only, printed media not included. Media used should be suitable for roller banner stands e.g.Charta Matt Lightblock.